Dorney Park traces its history back to 1860, when Solomon Dorney opened his picnic grove to the public. It is one of the few remaining trolley parks in the U.S. In the late 1800s and early 1900s, electric trolley companies often built amusements at the end of their lines to generate additional revenue. By the early 1900s, Dorney added rides and games to the mix, and through the years, the park has grown to include a world-class collection of roller coasters as well a host of other attractions. Coasters are the main attraction, however, and the thrill machines include a hypercoaster, along with floorless, inverted, and impulse models. 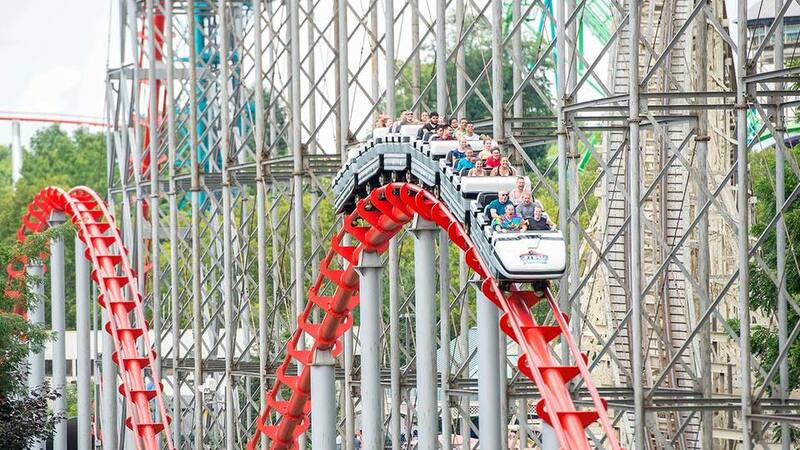 While it has all of the trappings of a modern-day amusement park, part of Dorney Park's appeal is its connection with the past. Riders can take a ride back in time by boarding some of its still-running classic rides such as the 1921 Dentzel carousel and one of the few remaining Whip rides (which dates back to 1920). Dorney Park also offers a good selection of shows (which change each season). Kids will enjoy meeting the Peanuts characters, including Snoopy. The park's Planet Snoopy is where many of the kiddie rides are located, including Charlie Brown's Wind-Up, Peanuts Road Rally, and the Snoopy’s Junction train. Dinosaurs Alive is an extra-admission attraction with animated dinosaurs. With a 205-foot drop, Steel Force is a great hypercoaster that hits 75 mph and is loaded with airtime. Possessed is an impulse coaster. It uses electro-magnetic motors to launch its train forwards and backwards along a U-shaped track and up two 185-foot spikes at 90-degrees. Because it is a floorless coaster, the legs of Hydra’s passengers dangle as the trains navigate the steel ride's many inversions. Talon is an inverted coaster, which means its trains are suspended under the track, and riders sit ski-lift style as they soar through the ride. ThunderHawk is Dorney Park’s classic wooden coaster. The figure-eight ride dates back to 1923. Rounding out the lineup are Wild Mouse, a steel coaster with hairpin turns, and Woodstock Express, a small coaster for young children. Don't forget your bathing suit. Wildwater Kingdom, the adjacent outdoor water park, is included with admission. Rides include Aquablast, a family raft ride, speed slides, a wave pool, a lazy river, and Island Water Works, an interactive water play center with a dump bucket. Cabanas are available to rent at the water park. Dorney Park offers pay-one-price all-day passes both at the gate and online at the park's official site. Discount tickets are available for children and seniors. Wildwater Kingdom water park is included with admission. The park offers reduced prices for "Starlight" admission (after 5 p.m. or 3:30 p.m., depending on that day's closing time), two-day admission, juniors (under 48 inches), and seniors (62 and older). It also offers season passes, and VIP tours are available (at VIP prices). The park is located in Allentown, Pennsylvania. From I-476 (the Northeast Extension), take Exit 56. From I-78 West, take Exit 54-B, and from I-78 East, take Exit 54. It is open from early May through late October. Wildwater Kingdom is open from early June to early September. See Dorney Park's calendar for more specific info about days and hours. The usual theme park dining suspects are available at Dorney Park, including pizza, hamburgs, fries, fried chicken, funnel cake, and ice cream. More intriguing options include Mexican fare at the Burrito Cantina, Chickie and Pete’s Sports Bar, which offers crabfries and lobster cheesesteaks, and the Tidal Wave Cafe, with items such as fried shrimp and pulled pork.